The scientific community first showed interest when Flossie McVey, a young autistic woman living in Dubuque Iowa, lost interest in her collection of stainless steel rotisserie forks after consuming two pints of the rich and reportedly awesome dessert. Upon further investigation, McVey was determined to have simply fallen asleep. Undeterred by this apparent setback, researchers carried on with the two year study. Participants gained an average of twelve pounds, but continued to study ceiling tile designs and to watch reruns of Star Trek: The Next Generation at the same rates as those who ate only Dryer’s Double Vanilla Bean. phhhhht! Lunch is now on my computer! Great post! Absolutely hilarious. I love it! In my own home, there is an ongoing and fully unendorsed experiment with dog food. So far, no discernible effects (except a defensive dog). You're trying to keep parents from helping their kids recover from autism! You're a shill for Big Frozen Yogurt! We have testimonials from thousands of parents that their autistic children spoke their first words (typically: "May I have some more, please?") only after intense HDVSA therapy. 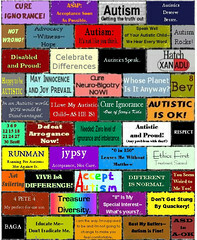 HDSVA therapy is the only hope that autistic children have to recover. Even those children who don't completely recover show significant advancement in their waist size, approaching and often surpassing "typical" children of their age. HDSVA therapy is also helpful in the treatment of ADHD, hypocholesterolemia, and calcium deficiency (although it seems to have limited efficacy against diabetes). Reports of weight gain, acne and dental caries are biased, flawed, corrupt and just more evidence of the massive conspiracy to cover up the True Cause of Autism! Shame on you for perpetuating this dreadful smear of Brave Maverick Ice Cream Distributors! What a shameful waste of resources. Everyone knows it is Baskin Robbins Pralines and Cream that cures autism. Well, everyone knows that not everything works for everybody. 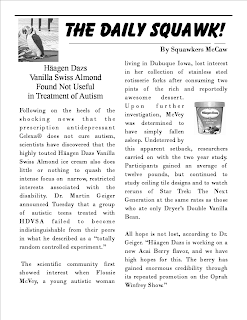 You shouldn't dismiss icecream treatments entirely just because one study failed to find results for Häagen Dazs Vanilla Swiss Almond. My aunt's granddaughter's cousin has 2 autistic kids and she noticed immediate positive results after giving them Ben&Jerry's Chocolate Fudge Brownie icecream once per day for a week. And if you find no icecreams are working for you, there's always scones with clotted cream and jam, or double-chocolate fudge. Just keep trying and you'll find a treatment that works for you too! Never give up hope! Ace reporter Ben Homestead has found that there is no autism in as many as 17 mostly Southern states in America--parents in those states only feed their children BlueBell homemade ice cream, rather than toxic Breyer's or Edy's ice cream. Since BlueBell is only sold in 17 states, it's obvious that Big Dairy is trying to suppress it and poison babies. Thanks for all the great comments! It was exciting to learn more background on this important study. But I have recently been experimenting with a course of therapy that takes a decidedly different approach. I have developed a ten-bean stew, to be administered in a dosage not to exceed one quart, in conjunction with a very large salad consisting primarily of broccoli and crushed raw garlic. The theraputic action of this treatment is deceptively simple: administered at dinner-time, all "symptoms of autism" will literally disappear overnight -- because, for the next 24 to 36 hours, no-one will dare get close enough to you to remind you that you have any such "symptoms" at all. The evidence in support of the efficacy of this treatment is unmistakable. But the most conclusive evidence, clearly, is that all the mainstream autism organizations have hired armies of "alternative," "biomed" and "medical science" shills to deride this treatment as "silent but deadly." So vehement is their condemnation, in fact, as to virtually prove that this is the long-awaited Miracle-Cure for the horrific plague of autism they have unleashed upon us. Join me, and let's give them a real whiff of Truth. If they can handle it. If not, we'll at least get to have a good laugh when the phrase "inappropriately-timed flatulence" somehow finds its way into their precious diagnostic criteria. "it's obvious that Big Dairy is trying to suppress it and poison babies." That's old news. Didn't anyone tell you about this? I LOVE THIS!!! oh my god. i am laughing out loud!! Well, we thought of trying this out but the only problem is that our Assistance Dog - trained to work with our autistic son - kept getting to the ice-cream before our son and now we have an ice-cream obsessed dog and a still autistic albeit thinner child!! Still trying to lose those 12 pounds. Gotta go watch me some Star Trek now. Oh, dear. This has got to be one of your best ones ever (and that's saying a lot)! I find this to be very offensive. I have tried this treatment and it has worked out well for me. I used to be the skinny, loner, sci-fi loving kid in school that no one really paid attention to. Then my mom started me on this ice cream as treatment for my autism. In the four months that I've been on this, I have gained 25 pounds and my waistline has expanded by 7 inches. As a result of this, kids are now laughing and joking with me and I am indistinguishable from my peers in weight and appearance. How dare you denounce this treatment that has been so helpful for me! Shame, shame, shame on you!